Friedberg 3 (W-603). 1861 $5 Demand Note. Boston. PMG Choice Uncirculated 63 EPQ. Face and Back Proofs.Hessler-242A. Plate A. Printed on India paper, mounted on original large, 335mm by 240mm, archive paper sheet. Imprint of the American Bank Note Co. New-York. Across center, full green color protector with large 5 flanked by intricate green pattern counters. Top center, Gothic title over obligations, payable office bottom center. Left end, statue of Freedom from the U.S. Capitol building. Series 7, Red 00000 numbers. Lower right, Alexander Hamilton. 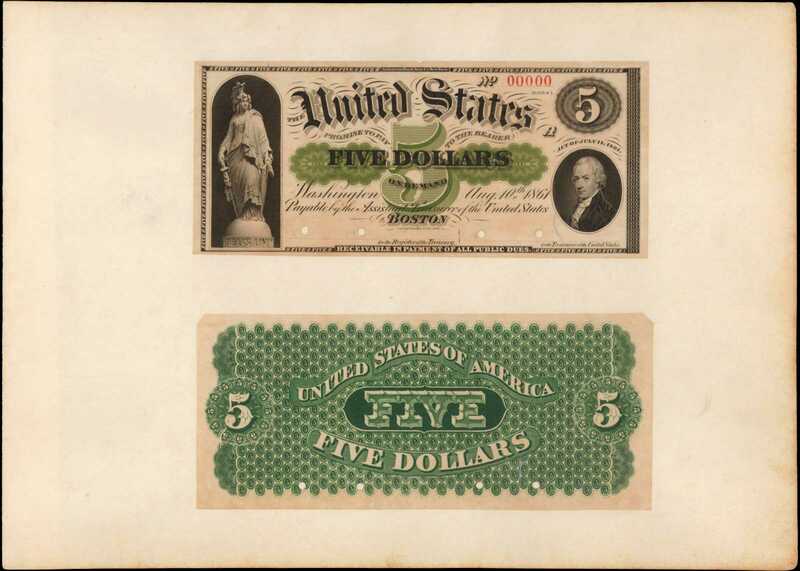 The face is mounted above, and just underneath is the full green color back as used on the Five Dollars Demand Note series. Pattern of repeating interlocking 5 counters. Center, FIVE, above title and below FIVE DOLLARS. Completely original throughout. Last offered in Stacks 52 Collection sale, Part II where it brought $18,400.pThis note is an excellent substitute for an unavailable circulation note of the same design and Treasury office.pFrom Stacks sale of the 52 Collection, Part II, January 25, 2011, lot 3299; Arthur M. Kagin Collection.